Adam Folker hasn’t always followed conventional patterns in life; after all, he’s a Canadian who ended up over 2500 miles away from home at UC Irvine. But Folker has made Irvine a second home. He travels back to Markham, Ontario for 10 days each summer, but for 50 weeks a year, UCI is home to an exceptional student athlete. On paper he’s a typical college athlete, averaging 8.1 points and 6.6 rebounds per game this season, while struggling with a 35.6 free-throw percentage; but outside of the Bren Events Center, Folker is a goal-oriented 23-year-old redshirt junior who has mastered time management. While working his tail off as the basketball team’s starting center, Folker also manages a 21-unit course load, taking Corporate Finance, Spanish 1B, Earth System Science and two independent studies classes in education and criminology. He can handle his own in French and wants to learn how to speak Chinese for international business deals in the future. After breaking his wrist in the team’s second preseason exhibition against Concordia University in 2010, the business economics major founded a digital marketing company to fill a void. He hopes to one day create his own foundation to fight world hunger; attain dual citizenship in the United States and Canada; play for the Canadian national team; play professional basketball; and to invest his earnings wisely. The Canadian center also aspires to own two homes, one in Orange County and one back home in Ontario. With all these benchmarks in mind, it may come as no surprise that the driven athlete/economist takes any challenge seriously, whether it was playing hard defense against Eric Wise in practice last year or doctors telling him to hang up his shoes after hip surgery nearly claimed his basketball career last summer. For Folker, winning the first Big West Championship in Anteater basketball history before his eligibility expires is just another attainable pinnacle. After redshirting last year with a cast molded over his right wrist, Folker – a former cross country and track runner – took to running and leg workouts to stay in shape. Those workouts eventually took a toll, though, as an MRI revealed that he had a torn labrum, micro fractures, a bone spur and cartilage damage in his left hip. Folker underwent surgery two days after his 22nd birthday on Feb. 15 last year. The complex procedure required for surgeons to shave down his hip bone as they reshaped the femoral head. Doctors told him to retire; Folker appreciated the motivation. Folker didn’t take part in a full practice throughout the summer or fall leading up to this season. Little by little doctors allowed him to work out for 10 minutes, then 20, then 30. Just days prior to the start of the season, Folker was wearing sweatpants on the sidelines while his teammates were running scrimmages. But in the season opener on Nov. 11, the center played 13 minutes against a ranked opponent, California. Folker tallied 13 minutes, scoring four points and grabbing three rebounds in his first official action in 20 months. As the season has progressed, his minutes have risen. In 27 minutes against Cal State Northridge on Feb. 25, Folker scored a career-high 28 points, which was just his second time eclipsing 14 points in his UCI career. He also collected nine rebounds and scored a reverse lay-up for the game-tying bucket after collecting his own miss to tie the game at 83 with four seconds remaining. Folker then scored seven of UCI’s 11 unanswered points to start overtime, clinching the 94-85 Anteater victory. While the savvy fourth year hopes to expand his business operations on the side, he is expected to graduate in June. He will, however, continue to play out his senior year in an Anteater uniform next season – music to Coach Russell Turner’s ears. In Oct. 2010, before ever coaching a UCI game, Turner claimed that Folker was his best rebounder, based solely on game footage that he had studied throughout the summer. “He’s probably the most talented rebounder I’ve seen on this team,” Turner said at the time. Effort and positioning give Folker the edge in the low post. The big man has reinforced his coach’s comments, ranking fifth in the Big West in rebounds this season. Folker looks the part of a college basketball player, but he eats like a nutritionist. He sticks to a strict diet — sans gluten, meaning no pasta, no breads, plenty of protein and healthy fats. Wearing size 15 shoes around campus, his backpack hangs higher than most. Back home in Markham, Folker grew up in an athletic family. His mother, Helen, is a 5-foot-9-inch triathlete. His father, Gary, won a Canadian basketball National Championship at Acadia University in 1971 – he’s 6’4”. Adam’s older brother, Mike, followed in his father’s footsteps and played at Acadia as well – he’s 6’6”. Adam is 6’9”. Folker grew up mountain biking and building tree houses and forts. On snow days, he would shovel his way out the front door when the buses couldn’t make their rounds, just so he could make the most of his canceled day of school. When his Anteater teammates exited buses to walk 100 feet from to the arena in Anchorage, Alaska this past Thanksgiving, many looked as if they were prepared for a blizzard and frost bite, covered up by snow pants and heavy jackets; Folker mocked his coddled Southern California teammates while wearing sweatpants and a hoodie. The tallest of the Folker bunch, Adam had California dreams after visiting the Irvine campus. In high school, he was named to the All-Canadian First Team as a senior – being placed among the top five high school basketball players in Canada. He also qualified for the All-Ontario Academic Team that year. Folker had played in tournaments in New York and Boston growing up, but he and his friends back home had always seen shows like “The O.C.,” so Newport Beach and Orange County were familiar names. When he calls home during the winter, he can sense the jealousy that it is 70 degrees on Christmas in Irvine, while Mom and Dad are snowed in. 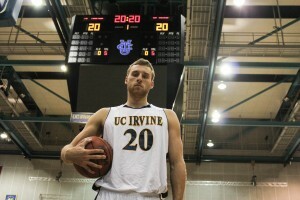 Every personality is different for the 2011-12 UCI men’s basketball team. Folker says “pasta” different than Daman Starring would. He rides snowmobiles and ATV’s in the offseason; Mike Wilder plays volleyball in his spare time. Folker watches game film religiously – for hours – picking apart his own footage, his team’s footage, and his opponents’ footage, more so than the rest of his teammates. But in the grand scheme of things, Folker couldn’t be happier with the way his team has come together as a unit this season. After a long day, Folker returns home to Newport Beach, like so many other Anteater athletes. He doesn’t live with teammates, but with three women’s tennis players. How did he swing that one? Whether it’s out supporting the women’s tennis or soccer team, eating at team dinners or sprinting down the court, the men’s basketball team is always together, and Adam Folker is one of the guys. Folker’s selflessness has helped unite and mentor one of the youngest team’s in college basketball. The ambitious Anteater has the attitude necessary to flourish in life. Soon he’ll have to decide what that life entails, but at the moment, Folker’s doing it all – in the classroom, in the business world, and in the Big West. 20 Responses to "The Folk Story"
Great site – you are a true inspiration! Congrats on all your success. Your story truly inspires me and gives me more motivation to be the best athlete I can be! Congrats on all your success! Keep up the work! Wow! Reading this really opened mu eyes. You never let anything stop you, and you worked really hard no matter what. I wish I could have done better this season. This is motivation right here. I love your story. As we play our last game today (and mine) I will be thinking about not stopping and giving it my all. You were meant to shine. It’s because you earned it. Your website has actually help me with the healing process of my torn ACL (surgery almost three months ago). There are many people who have told me to keep my head high but it gets harder by time to keep on going. You are an example on what’s called ambitious 😀 keep rockin’! Thanks Paula! Continue to work on your rehab and stay positive and you will be back in no time! Interesting read man! You should read up on Shawn Redhage’ hip injury & amazing recovery! He is an expat American playing in our national league here in Australia. Good luck leading into march! Thanks Tim! That I will do, and appreciate the support. Very inspirational story! Pushes me to go beyond my limits of the court. Love your story! You liked one of my photos on Instagram so I checked out your page. You seem awesome! My little brother, Trey Hoebee has an unofficial visit to UC Irvine for basketball sometime coming up. Check him out on YouTube! Keep up what you are doing! all our love, kassie & brother joey! I just want to say that reading your article and seeing all of your inspirational quotes really motivated me. I too play basketball and I have been told by my dad, coaches, and friends that it might not be in my future. I love the game though. I thought about maybe giving it up, but reading this gives me more motivation to push on and prove all the nay-sayers wrong! You are truly an inspiration to people in all walks of life from sports to non-related things. I think it is wonderful that you use your drive and success to encourage others. It’s also a great marketing plan. Keep it up!